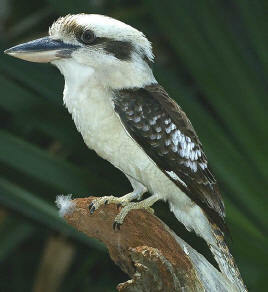 The Laughing Kookaburra is endemic to the forests and woodlands of eastern Australia. Because of its loud calls and large size it is one of Australia’s most familiar birds. Differences from Blue-winged Kookaburra include: brownish crown, dark streak through eye and dark eye. It is the world’s largest kingfisher. The territorial call can be described as raucous ‘laughter’. They spend most of the day on high branches or posts overlooking rainforest clearings or disturbed agricultural areas where they swoop on small snakes, lizards or frogs. Young kookaburras continue to live at home for about four years. During this time their parents put them to good use; young laughing kookaburras perform about a third of incubation and brooding duties for the next generation and supply the nestlings with over half of their food. A family of seven Kookaburras regularly visits Chambers Wildlife Rainforest Lodge and entertains the guests with a chorus of laughter before they come down onto the lodge railings to accept meat scraps. The ‘Laughing Kookaburra’ is found in the Daintree region and it can often be seen sitting in a perch in or on the edge of the forest, and sometimes seen on the Bloomfield track or around Daintree village. The strong heads and beaks are also useful for when they may build their nests, for they are often excavated out of arboreal termite nests. The breeding pairs will often take turns flying hard at the nest, cracking another dent in the hard exterior. They continue until they have dug a hole for the female to lay eggs and raise the chicks within.